Pastors Brent and Adrienne Ancell were married August 17, 1996. From the very start of their relationship they knew God had called them to do something great with Him. They first served as children’s pastors and outreach directors from 1997-2003 at Jubilee Family Church in Oskaloosa, Iowa. Brent was also the lead guitarist on the praise and worship team. Adrienne worked as assistant to the senior pastor, as well as dean of a church-based Bible school. 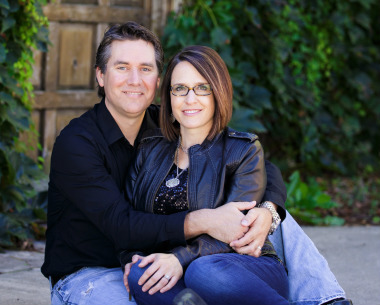 In August, 2003 Brent and Adrienne moved to Tulsa, Oklahoma to attend Rhema Bible Training Center (Kenneth Hagin Ministries) and Domata School of Missions (Mark Brazee Ministries.) During this time they were also employed at Kenneth Hagin Ministries / Rhema Bible Church. Brent worked in Faith Library Publications as a sales representative. Adrienne worked as the assistant to the director of communications. After graduation God put a burning desire in Brent and Adrienne to move back to their home state of Iowa and pioneer a church that would reach out to the Des Moines area and beyond to the Nations of the world. This is how World Outreach Church was birthed. Brent and Adrienne endeavor to be relatable pastors that lead people into an exciting and personal relationship with a very real, touchable God. Their heart is to help people discover their purpose and live life with passion. This life results in loving God first...then loving people...and changing the WORLD.